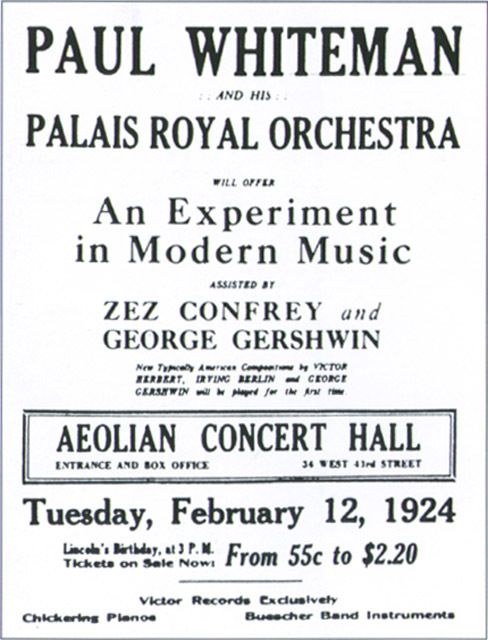 Paul Whiteman’s “An Experiment In Modern Music” at Aeolian Hall on February 12, 1924 is well known for the premiere of George Gershwin’s Rhapsody In Blue. Yet it also placed an American popular music ensemble in a concert setting, at a venue typically associated with classical artists, to perform several original works that challenged preconceptions of both jazz and classical (fourteen years before Benny Goodman’s Carnegie Hall concert and several decades before “crossover” entered the lexicon). Critics have weighed in on the merits of the rest of the program as well as Whiteman’s supposed aim to refine jazz. Now there’s an opportunity to hear all of the music live and judge for oneself. 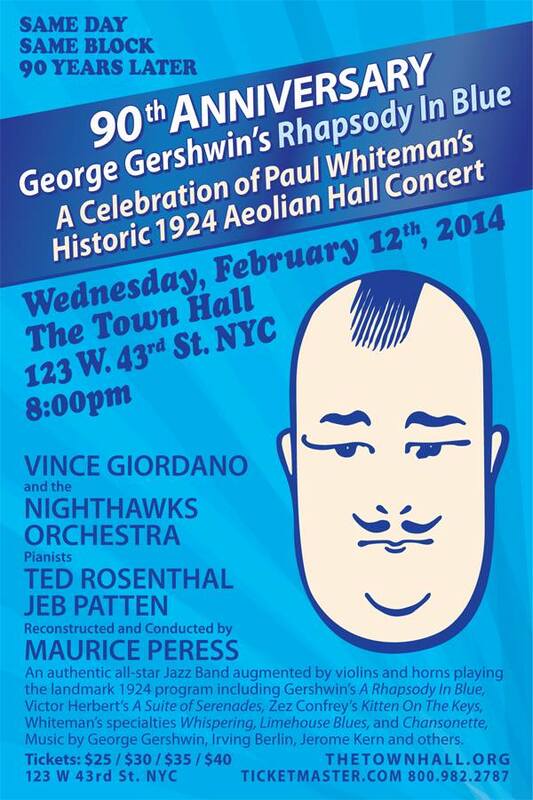 To celebrate the ninetieth anniversary of this event in American music, Vince Giordano And The Nighthawks will perform the entire program, with conductor Maurice Peress directing the band on his meticulously researched transcription of Rhapsody In Blue, featuring pianist Ted Rosenthal. The audience also gets to enjoy Whiteman’s own dance music performed with the Nighthawks’ distinct blend of energy and understanding, as well as pianist Jeb Patton playing Zez Confrey’s whirlwind piano pieces. If you are in or around New York City on February 12 (and let’s face it, anywhere on Earth might as well be around New York City), don’t miss this music. Tickets and more information are available online here.